One of those voices came from a church youth leader when Chris was in high school. “Because of his influence, I participated in the Miller Summer Youth Institute the summer before my senior year—the first year that Erin Davenport ’05 and Derek ’05/’17 Davenport directed the program. SYI (which I’m still involved with as a seminary intern) put full-time ministry in the back of my mind,” Chris reflects. And it stayed there through his years as a history major at the University of North Carolina, Chapel Hill, where he involved himself in Presbyterian Campus Ministry. “I was born in Pittsburgh but moved to North Carolina when I was seven years old,” Chris says. “I decided to look at Pittsburgh Seminary for my theological education but didn’t think I’d end up enrolling here, even though returning to Pittsburgh was a real draw for me.” Surprise! 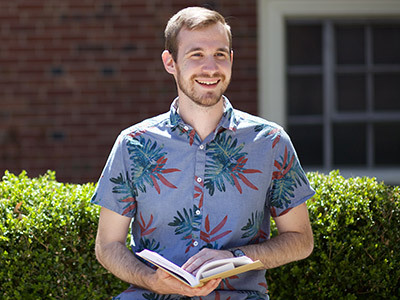 “A number of factors influenced my choice of PTS, but one of them was that, though this seminary is rooted in the Presbyterian tradition and enrolls a lot of Presbyterian students, other Christian traditions are also widely represented, both in the student body and on the faculty. Here Presbyterianism is prominent but not overwhelming,” Chris notes. At PTS, Chris has been able to explore these questions via independent studies, such as the eco-theology course he’s pursuing this semester. He’s also been able to shape final projects for curricular courses in ways that focus on creation and the outdoors. 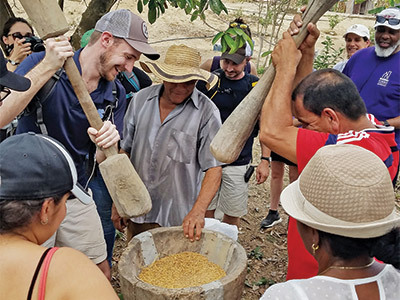 And through “really eye-opening” World Mission Initiative trips to Colombia—“my first truly international trip, which allowed me to experience and expand my understanding of God through a different language and culture”—and the Philippines, which in January will focus on the environmental crisis, Chris is able to blend his vocational interests and his program of study.